The morning lines favorites for Sunday night’s third round of the Dygert stake series for ICF 3-year-olds have made the journeys to the top of their respective classes in very much different ways. The Flacco Family Farm’s home-bred Louscipher (Casey Leonard), the 8-5 first flash favorite in the Erwin F. Dygert Memorial for trotting colts and geldings has had a much busier first two seasons of racing. The Roshun Trigg trained gelding has gone postward more than twice as many times as Danny Graham’s home-bred filly Annas Lucky Star. 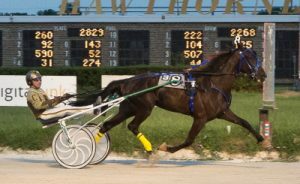 Louscipher made 15 starts as a freshman, winning 7 times and taking second on 5 other occasions when he made nearly $80,000 for his Alexis, Illinois owner and breeder. 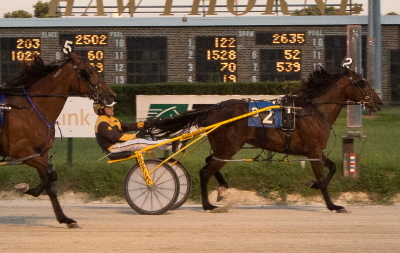 He captured the $75,000 Kadabra Final on Hawthorne’s Night of Champions. The son of Lou’s Legacy has racked up four wins in nine tries as a 3-year-old including a leg of the Erwin Dygert but was a beaten favorite in his last two outings, a Cardinal elimination and the championship. Louscipher’s first 2-year-old start came in late June of 2016 and then he gained valuable experience as a freshman competing at four different fair tracks before going on to take both the Kadabra championship and the Cardinal in his last juvenile start. Meanwhile Annas Lucky Star, the 3-2 Beulah Dygert Memorial programmed favorite, went postward only six times in her unbeaten freshman campaign and made considerably less money ($36,970) for her Salem, Illinois owner and breeder. A nomination snafu by her owners prevented the Cassis filly from racing in any of the legs of last years Hawthorne’s Fox Valley Flan series for state-bred 2-year-old fillies and going for a $70,000 pot in that final. Annas Lucky Star made her initial career start a month later than Louscipher and didn’t compete on the Illinois County Fair Circuit. Instead she was pointed for the two State Fair Championships at Springfield and Du Quoin and won both. However the filly was scratched out of the Violet late last September in what was to be her last start as a 2-year-old when she came up sick. 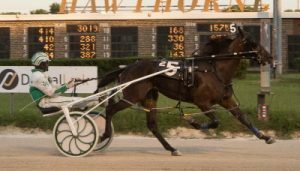 The filly did triumph in a second leg of the sophomore trotting series in early July after making three prior starts in June. Health issues again cropped-up and kept her from starting in the Violet prep on July 9. Violet champion Annas Lucky Star, driven by Kyle Wilfong, was joined in the Hawthorne winner’s circle by owner Danny Graham, his wife Cindi (right), their granddaughter Abbie (center) and her friend Sydney (left). (Four Footed Photo). Two of Annas Lucky Star starts in June resulted in her only second place finishes, the first behind Keith Crawford’s good trotter I Could Care Less, a six-time winner at the Hawthorne meet, and to Louscipher. Since both are geldings Annas Lucky Star still hasn’t lost a race in her career to another filly. With the favorite one-post Annas Lucky Star could very well stay unbeaten against fillies when she goes after the winner’s share of the Beulah Dygert $16,000 pot. The $8,000 check for winning would put her season bankroll to $35,480, almost matching her freshman total, with Springfield, Du Quoin, and the fourth leg and the final of the Beulah Dygert still on the horizon. Taking on Annas Lucky Star in the fifth race filly stake (from posts 2 through 9) are: Fox Valley Elana (Tim Curtin), Lous Credit Report (Mike Oosting), Lous Game N Match (Matt Krueger), Sis’s Ellie Mae (Jared Finn), Beatrice (Casey Leonard), Daisy Lou Duke (Kyle Husted), Dandy’s ESP (Gary Rath) and Fox Valley Ella (Dale Hiteman). Muscle Image, a rather comfortable winner of the Cardinal is listed at 3-1 and has gotten into top form at the right time. The Mike Brink trainee could give Louscipher all he can handle and so could Trixie’s Jethro (pp2, Jared Finn), a first leg victor of the Erwin Dygert who has excellent gate speed and is listed at 4-1. The Gerald Hanson Stable’s Picky Picky Valor (Brian Carpenter) was an easy front-stepping winner of the Cardinal Prep before he broke on the move in the final at 3-1 and could be an overlay at the morning line odds of 12-1. Let’s Go Color (Jesse De Long), Totally Pazzazzed (Dale Hiteman), Bands Houdini (Kyle Husted) and Free Range Chikin (Juan Franco) are the other third race hopefuls. Sporty Redhot was hustled out to a quick lead by driver Juan Franco in the first $16,000 state-bred 3-year-old male pace and never looked back, winning in 1:54.1 for owner Al Beals of Berwyn, Illinois. The Kim Roth trainee was able to get away with a modest 59.1 first half when the early pocket horse Causway went off stride and impeded three horses, including the heavy favorite Fox Valley Nemitz who would later make a break in the race and end up last. Fox Valley Inferno nosed-out Fox Valley Reggie for second, both beaten 1 and 1/2 lengths. 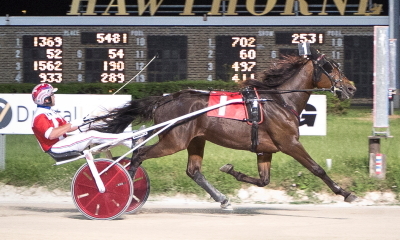 Fox Valley Herbie (Mike Oosting) stalked the pace-setting Ima Skydancer in the second Carey division before powering past for a two-plus length triumph in a career fastest 1:53.4 clocking. Slzburgerslzburger came from far back for second place honors while the 23-1 longshot Decent Sawyer was third. The Tom Simmons Stable’s Fox Valley Herbie also won a second leg of the Carey for Springfield owner Benita Simmons. As expected Saturday night’s third round of the Robert F. Carey Memorial series was split into two divisions. The stake events for ICF 3-year-old colts and geldings will go as races four and eight on Hawthorne’s 10-race program. 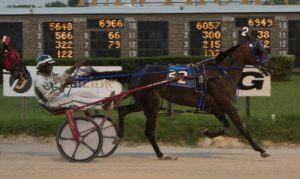 Eight sophomore pacers will take another shot at the division leader Fox Valley Nemitz who as earned his way to the top spot for his owners and breeders Fox Valley Standardbreds of Sherman, Illinois. The Nick Giberson trainee drew nicely with the two-slot for regular driver Casey Leonard and very likely will be the deserving overwhelming favorite. Fox Valley Nemitz captured both of his first two Carey legs and n last start two weeks ago was a dominant winner of the Cardinal with a career fastest 1:51.1 mile. Taking their best shot at Fox Valley Nemitz will be Causway (Bob Smolin), Sporty Redhot (Juan Franco), Fox Valley George (Freddie Patton Jr.), Gabe Henry (Ridge Warren), Fox Valley Inferno (Kyle Wilfong), Fox Valley Hoss (Kyle Husted), Uptown Sleaza (Jim Lackey) and Mississippi Rabbit (Mike Oosting). On the other hand the second Carey division may not have a prohibitive favorite. Both Fox Valley Herbie (Mike Oosting) and Ima Skydancer (Kyle Wilfong) have a Carey leg victory on their card. And Casey Leonard is back behind Slzburgerslzburger who uncorked a wicked 26.1 last quarter in a winning effort a week ago. Then there’s Captain Rhett who dropped a close head decision to Fox Valley Nemitz in round two of the series and last week looked good getting an overdue triumph. Anyone of these three pacers could end up as the public’s choice. Looking to pull an mild, or in some cases a major upset, are Decent Lawyer (Jim Lackey), Commondiscourtesy (Matt Kruegert, Spirited Encounter (Bob Smolin), In Your Eye (Ridge Warren) and Sullivan (Kyle Wilfong). I had a chat earlier this week with Captain Rhett’s veteran trainer Jim Horvath and asked him to fill me in on the stable’s prize pacer owned by Illinoisans Harvey Grief (Odell) and Robert Verdun (Pontiac). They paid a modest price $2,500 when the horse was a yearling at the 2014 Illini Classic Sale. “When we brought him out as a 2-year-old he was an absolute monster. When we schooled him he won by 30 with a 27 last quarter. He qualified in 2:00 and the judges were giving horses 5 seconds that day. He made a brief break in his first start and got disqualified from second to sixth and he still paced in 56 and a piece with a 27.2 last quarter. “His problem began before his first leg of the 2-year-old stake. I was walking in between barns and went into barn two by mistake. I’m in barn three. The water truck went by so I stopped with him. When I took him out of the barn the water truck backed-up and the beeping sound it made scared the heck out of him. “The horse went right in to the air, came down on me, crushing me like a grape. He was a stud horse at that time. He raced in the stake series and got used about three times and still, got third. Harvey (owner Grief) then decided to have him cut. After they did the horse had no ambition to beat anybody. “He ended up only missing one check as a 2-year-old but he really wasn’t aggressive. He’s come back this year a much different horse. He’s a great horse to be around and is like a baby in his stall. But I do race him with ear plugs and a min-bit because once he gets behind the gate he gets very aggressive. Thus far Captain Rhett hasn’t missed a check yet this season and he’s closing in on $20,000 this year going into Saturday’s stake. There will be a driver change on the horse tonight. Tim Curtin had been driving however he chose to steer Ima Skydancer in the Carey. 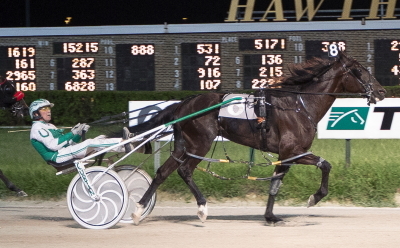 Taking over is Kyle Husted who drove Captain Rhett as a two-year-old in the horse’s first four starts. Looking Peachy: Kyle Wilfong put Boogie On Down ($6.20) on the front end in last night’s first $16,000 Plum Peachy stake for ICF 3-year-old fillies and the home-bred pacer pulled away to an almost three length victory in her 1:54.1 mile. Fox Valley Charliz ended up second for the fifth time this season in 10 starts while the first over Princess Sage settled for third. Boogie On Down is owned by her breeders Lynn Wilfong and trainer Brett Wilfong. In the fourth race second Plum Peachy spit the lead changed hands four times before The Terry Leonard Stable’s Lady’s Party ($3.20) took over for good in the lane. Aided by an advantageous trip from Casey Leonard she nailed down her sixth season win, this one in 1:54.3. Fancy Creek Jolene rallied for second place honors, one length behind, while My Kind Of Dance had a game effort to take the Show spot. Lady’s Party is owned by Mitch Titus and Dennis Wright, both of Charleston, Illinois, and now has banked over $45,000 this year. Casey Leonard had four more winning drives on Friday’s card while Kyle Wilfong posted a driving triple. As we pointed out a couple of weeks ago on the eve of the Violet Final, this season’s ICF 3-year-old filly pacing division has been unpredictable. If it seems like the 2017 crop of state-bred sophomores are taking turns beating one another, that’s because that’s exactly what is happening. In fact none of tonight’s Plum Peachy starters have won two races in a row this year except Lady’s Party and her three straight came in the Late Closer Dave Magee Series back in May when she was taking on easier foes. The third go around in tonight’s Plum Peachy stake series was split into two divisions each with an increased pot (from $12,000 to $16,000) on the line this time. The Donna Holt Stable’s Filly Forty (Jamaica Patton) was a first division winner of the Plum Peachy and was second in the next round. She secured her second win of the season a few weeks later in a Violet elimination. However, Filly Forty obviously wasn’t right for the Violet Final when she was in the two-hole at a 58 first half, but ended up tenth and last at the finish, some 10 lengths behind and she drew the outside seven-slot in the first race. The 2016 Illinois Horse of the Year Princess Sage (Freddie Patton, Jr.) is having an up and down season in her 3-year-old campaign due to some health issues. She was much better (1:53.1) in round one of her Plum Peachy, but hasn’t been better than fourth in a trio of outings since. 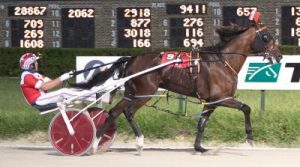 Clark Fairley’s Fox Valley Charliz is one of two fillies in tonight’s first division without a win yet this season, but she does have four second place finishes in nine trips postward and drew nicely with the two-slot for regular driver Mike Oosting. Fox Valley Dandy (pp5, Matt Krueger) was a game winner in her first Plum Peachy but had a pair of disappointing finishes in her two starts that followed. My Mona Me (pp1, Tim Curtin) and C Far (pp6, Gary Rath), both listed as 20-1 longshot in the morning line, are tonight’s two other first division aspirants. The fourth race, second Plum Peachy stake, landed the division’s current top three leading fillies: Fancy Creek Jolene (pp 2, Matt Avenatti), A Real Doozie (pp 3, Mike Oosting) and Lady’s Party (pp 5, Casey Leonard). Fancy Creek Jolene was a surprise winner at 45-1 odds in her Plum Peachy but made a break and finished up the track in the second round. She rebounded big-time for trainer Kim Hamilton with a late-charging 1:53.2 triumph in the Violet Final, this time at 10-1 odds. A Real Doozie from the barn of trainer Mike Brink, and the Terry Leonard Stable’s Lady’s Party have been the most consistent fillies in the division. A Real Doozie is a three-time season winner and one of those wins came in the first Plum Peachy. She got nosed-out in her Violet elimination and was roughed-up a bit in the final, when she ended-up fifth. Lady’s Party has been third or better in all nine season starts with five stops at the Hawthorne winner’s circle. She followed her sweep of the Dave Magee Series with a third in the initial Plum Peachy and a second place finish in leg two. She was also the runner-up to Fancy Creek Jolene in the Violet championship. Hoping to pull off a surprise victory in the second division is My Uptown Girl (Brian Carpenter), Ashlee’s Cocktail (Kyle Wilfong), My Kind Of Dance (Juan Franco), Dandy’s Dududidudu (Kyle Husted) and Windian (Bob Smolin). Open is Just That: This weekend’s $13,500 Open Pace will go as the second race Friday night with six starters and no-clear cut favorite. Hawthorne’s morning line lists last week’s winner, A Bettors Risk (Kyle Wilfong) at 5-2. The Patron Ode trained gelding was assigned the six-slot. At 3-1 are both Mystical Walter (Casey Leonard) and Coal Hanover (Kyle Husted) and they drew for posts 4 and 5 with the former getting the four. Kelly D, fresh off six length romp in a high conditioned level has Mike Oosting back at his lines and is at 4-1 with the two post. At 8-1 is Account Hanover (Tim Curtin), allocated the three-slot and KC Rambuctious Boy (Ridge Warren), dispensed the rail for his first start of the meet in the Open. With only a handful of racing nights left in July we’ll get our last look at ICF stake events this weekend on the Chicago circuit, until the month of September. Hawthorne won’t be presenting any stake races in the month of August. Instead it’ll be the State Fairs first at Springfield (Aug. 11) and later at Du Quoin (Aug. 27) that will be the host venues for added-money state-bred contests. That makes this Friday, Saturday and Sunday’s third round of Hawthorne’s stake series crucial for owners and trainer for their 3-year-olds to earn a lofty number of points with a high finish if they are to advance to a lucrative Final (estimated at $105,000 to $112,000 for pacers and at $78,000 for trotters) on the Night of Champions rather than compete in a $20,000 Consolation. The third round stake series divisions will see each purse jump to $16,000. The first two legs all had a $12,000 pot. 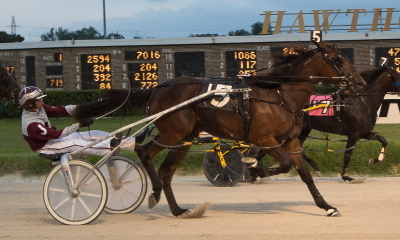 Friday night is the third leg of the Plum Peachy for Illinois bred sophomore filly pacers. Their male counterparts compete Saturday in the third go around of the Robert F. Carey Memorial. On Sunday evening both of the trotting Dygert’s, the Beulah for fillies and the Ervin S. for colts and geldings, will be the headliners. Filly Forty is the leading point earner of the Plum Peachy going into Friday’s round of the stake series. (Four Footed Photo). After two legs of the Plum Peachy the Donna Holt Stable’s Filly Forty sits on top of the point standings with 75, getting 50 for her first leg win and 25 for a second place finish in round two. There’s a long jam for second with Princess Sage and Fancy Creek Jolene with 51 points each and Fox Valley Dandy and A Real Doozie with 50 apiece. All four fillies have a series leg victory but one point is awarded for a series start and both Fox Valley Dandy and A Real Doozie missed the opening Plum Peachy Series leg. Then comes Lady’s Party and Boogie On Down with 37 each, Rousey Ronda and My Mona Me, both with 30. Dandy’s Dududidudu is currently tenth with 24, followed closely by Ashlee’s Cocktail (20) and Windian (13). Another trio of fillies, C Far, San Antonio Rose and Razzleme Dazzleme are at 9. Only the top ten point earners in a Hawthorne stake series advance to a championship when the September 23rd gala evening of racing rolls around. Fox Valley Nemitz, from the stable of trainer Nick Giberson, already has sewn-up a starting berth in the Carey Championship with 100 points produced with triumphs in both of his series legs. In good shape are Fox Valley Herbie (62 points), along with Ima Skydancer and Royale Big Guy with 55 each, and Captain Rhett at 50. Then things get a little dicey for the pacers, currently six through 12, in the Carey standings. In Your Eye is next with 30. Decent Lawyer is at 26, one point ahead of Fox Valley Inferno. Gabe Henry has netted 20, Fox Valley Reggie has 13 and both Zone Blitz and Mississippi Rabbit have a dozen each. All the other starters in the first two Carey legs are in single digits with two legs left before the championship. Smart Move: Driver Mike Oosting made what turned-out to be a wise-decision in Sunday’s single leg of the Kadabra trotting stake series with Vic’s Pizza who was in the second tier with post 11. Since there wasn’t another starter in the second tier Oosting could have put his freshman trotting behind any of the young horses in front of him going to the starting gate. He chose to line-up Vic’s Pizza behind the winning favorite New Detective (Casey Leonard) who had post three. Oosting’s horse followed New Detective out, settled into third and came on to be second best in the stake, earning a $3,000 slice of the $12,000 purse for his owners. Vic’s Pizza would have very likely missed a check if Mike started out behind the rail trotter Krispy K, one of five trotters in the race to off-stride before or soon after the start. We’re getting to the mid-way point of the ICF two-year-old stake season for trotters with Sunday night’s second legs of both the Fox Valley Flan for fillies and the Kadabra for colts and geldings. It’s also around the time we start to separate the contenders from the pretenders when it comes down to the possible finalists in both stake series on Hawthorne’s (Sept. 23) Night of Champions. Thus far two major stakes races have been contested in the ICF freshman trot divisions, the initial legs of the Fox Valley Flan and Kadabra and the Violet and Cardinal showdowns. Still to come are the State Fair championships at Springfield and Du Quoin and the last two legs of Hawthorne’s stake series events. In the first season male trotting division the score is one each for Cardinal champion True Detective and the J D Finn tandem of Cruzen Cassi and Mt Erie Mafia, the opening leg winners of the Kadabra. The trio is among the eleven youngsters going postward in tonight’s seventh race Kadabra stake. Cruzen Cassi (Jared Finn) out-nodded True Detective in a division of the initial Kadabra stake series however True Detective turned the tables by winning by almost five lengths in the recent Cardinal. After a modest 30.2 third panel True Detective trotted home in 27.4 at the end of a 2:01.2 mile for owner and breeder Dr. Patrick Graham of Pittsfield, Illinois. Cruzen Cassi was a non-threating third in that race while stable-mate Mt Erie Mafia decided instead of trotting that night, he would run around the track and ended-up distanced. Trainer Mike Brink has a pair of starters in tonight’s Kadabra and the draw for posts couldn’t have gone any worse for the Springfield based conditioner, Illinimight (Kyle Wilfong) drew the outside 10-post while Cardinal runner-up Vic’s Pizza has to start in the second tier with post 11. Thirteen or more entries were needed to split the stake race but maybe down the line something can be worked out to make it a fair start for all the competitors. If an owner(s) writes a check for a four-figure stake nomination payment and then hands over a $200 starting fee for each leg as well, he or she should be able to have their horse on the gate. Even with an outside post a driver has a choice: He can leave for the lead or an early hole or he can duck and take his chances from coming from out of it. With a second tier start there’s no choice to be made. The driver follows up the one-horse and is at the mercy that horse stays on stride (no sure thing with a 2-year-old trotter). He then hopes he doesn’t get into a traffic jam and somewhere in the race Lady Luck gives his horse a path to a possible victory. Here’s how they’ll line-up: Krispy K (Mike Rogers), Fox Valley Strpwr (Freddie Patton Jr.), True Detective (Casey Leonard), Mt Erie Mafia (John D Finn), Majistic Caprice (Paul Cavett), Cruzen Cassi (Jared Finn), Talk About Valor (Gary Rath), Jiggle The Handle (JD Lewis), Legal Entry (Kyle Husted) and Illinimight (Kyle Wilfong) with Vic’s Pizza (Mike Oosting) getting a rear-end view of the competition. With 15 entries for tonight’s Fox Valley Flan the 2-year-old filly trot was split into a pair of $12,000 divisions. The second race first division of the Fox Valley Flan is headed-up by Violet champion Trotting Grace (pp 3, Kyle Husted). The Cassis filly is listed at 7-5 in the Hawthorne morning line. Looking to knock off the Steve Searle trained filly is E L Miss Kaibra (Mike Oosting), Fox Valley Persia (Bob Smolin), Lous Silver Star (Casey Leonard). Honey In A Hurry (Dale Hiteman), J Cougar (Tim Curtin) and Princess Ashley (Kyle Wilfong). The fifth race second division Fox V alley Flan event will likely see much of the wagering fixated on Violet champ Maui Mama (pp7, Casey Leonard) and first round Flan victor Good Design (pp 2, Kyle Husted). Maui Mama will be at prohibitive 4-5 first flash odds while Good Design opens at 5-2. Undeniable Emotion (Mike Rogers), Sunny Sasha (Jared Finn), Fox Valley Winnie (Dale Hiteman), Fox Valley Unleash (Jamaica Patton), Frontier Jackie (Tim Curtin) and Powerful Temtrist (Brian Carpenter). It’s All Casey: The second round of the Incredible Finale stake series for ICF 2-year-old male pacers turned out to be the Casey Leonard show as the meet’s leading driver steered all three winning freshman. Casey guided Jim Ballinger’s Fox Valley Gemini ($2.40) to his fourth consecutive win in as many career starts in the opener. The Terry Leonard trained gelding shook loose from the middle of the pack coming out of the last turn and pulled away to a 1:56.1 mile at prohibitive odds of 1 to 5. Beach Shootingstar was second, beaten two lengths and Not Me Gram took the third place check of the $12,000 purse. In the second Incredible Finale split Casey hustled the Tripoli Stable’s Mykonos away from the outside eight-slot and dropped the Tom Simmons trainee into fourth in the first turn. Casey pulled Mykonos ($10.20) out right before the half-mile pole, reached in 1:00.2, and the youngster quickly brushed to the top in the turn, opened up by four lengths in the lane, and had enough left to hold off the favorite Dandy Dune by three-quarters of a length. Backstreet Lawyer was third in the 1:56.2 mile. In the third Incredible Finale stake Leonard was able to give Dane May’s Lambo ($9.40) a perfect pocket trip and the Duneside Perch gelding responded by overtaking the pace-setting Bootleg Island in deep stretch for his first career win in three starts. Hart To Heart was third in the 1:55.2 sixth race mile mile, the fastest of the three Incredible Finale second leg divisions. Casey would go on to drive four more winners giving the 39-year-old Harvard, Illinois native a total of seven on the 12-race card. The journey to Hawthorne’s Night of Champions makes a pivotal stop Saturday night for ICF 2-year-old colt and gelding pacers with the second leg of the Incredible Finale Stake Series. With an abundant 26 freshmen pacers entered, while their owners ponied up a $200 starting fee, three $12,000 divisions of the stake will be sprinkled through the first half of a 12-race card, starting with the opener. The early division leader Fox Valley Gemini (Casey Leonard) is expected to be heavy favorite when he leaves from post four. I have him at even-money in my line. The Terry Leonard trained gelding is unbeaten in his first three starts for Atwater, Illinois owner Jim Ballinger. Fox Valley Gemini wasn’t ready to begin his racing career when the first Incredible Finale was contested on June 17 (he qualified only two days earlier) but he quickly has vaulted to the head of his class. Fox Valley Gemini won his pari-mutuel debut on June 22 in 1:57 flat. In his second outing he captured his Cardinal elimination despite a first-over trip. The Yankees Skyscraper freshman then breezed in the Cardinal Final with a 1:54.4 clocking. Heza A Real Shooter (Bob Smolin), from the barn of trainer Bill Crone and the Tom Simmons Stable’s Beach Shootingstar are the likely next two betting favorites in race one. Heza A Real Shooter was victorious in his first leg of the Incredible Finale, a race where Beach Shootingstar was hammered down to 2-5 odds but found himself a locked-in seventh most of the way before shaking loose and pacing a 27 last quarter to be fourth. Not Me Gram (Ridge Warren), Ernie The Mooss (Gary Rath), Piscotty (Ryan Anderson), Molina (Kyle Husted), Herecomesmagotta (Tim Curtin) and Dandy’s Phoenix (Kyle Wilfong) complete tonight’s first race field. The third race second division brings out Mykonos (Casey Leonard), an opening leg winner of the Incredible Finale in his initial start, and three youngsters with recent wins at Hawthorne—Fox Valley Hipster (Cliff Bell), Dandy Dune (Tim Curtin) and Backstreet Lawyer (Mike Oosting). They’ll be challenged by Big Boy Frazier (Cornelius Cavett), JB’s Enigma (Bob Smolin), Al’s Briefs (Kyle Wilfong) and Safari Sage (Ryan Anderson). After going off-stride in his first two starts Fox Valley Hipster was a front-end winner in1:57.3 eight nights ago. 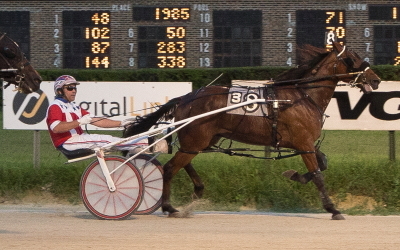 Backstreet Lawyer, who missed the Cardinal Finale due to sickness, bounced back on July 15 with a 1:56.4 clocking. Dandy Dune didn’t make his first start until his Cardinal elimination and won it in 1:56.2 for owner and trainer Dane May. The Sagebrush gelding was second best in the final to Fox Valley Gemini and paced a 1:55 flat mile. It’ll be interesting to see what 2-year-old emerges on top in the sixth race third split of tonight’s Incredible Finale. The Shawn Nessa Stable’s Sheriff Coffey (Tim Curtin) made a strong case it will be him with convincing 1:55 victory in an open company 2-year-old event a week ago. A son of Sagebrush, Sheriff Coffey is a foal of Kiss Of Life, a daughter of Cole Muffler who competed for trainer Homer Hochstetler as a 3-year-old back in 2005 and was second best in a $250,000 American National at Balmoral and was a Grandma Ann elimination winner. Dane May’s Lambo was a competitive fourth debuting in a Cardinal elimination and finished third prepping for this start last week. Casey Leonard takes over his lines tonight for Tyler Shehan who is at Lebanon Raceway where he’s driving four of his stable’s youngsters in Kentucky Sired Stakes. A price shot to consider in this division is Hart To Heart (pp 2, Mike Oosting) from the Mike Brink Stable. The home-bred had two very nice winning Springfield qualifiers in June prepping for his debut but had some bad racing luck bowing in a Cardinal elimination. He then missed his next scheduled start a week later when he was scratched sick. Oosting chose to drive Hart To Heart) over the No. 5 freshman Bootleg Island. Also looking to score some stake series points are Ricky The Flash (Freddie Patton Jr.), Sagebrush Jim (Brian Carpenter), Bootleg Island (Kyle Wilfong), Shooting Straight (Bob Smolin), Talk About It (Ridge Warren) and Sagebrush Sharp (Jamaica Patton). Juan-derful Victory: Cynthia Kay Willis’ home-bred freshman filly Lex Two put on a furious rally down the stretch for driver Juan Franco and got her nose ahead of Red Hot Packerette (Mike Oosting) to capture the first $12,000 division of Friday’s Incredible Tillie stake series for ICF 2-year-olds. Trained by Nelson Willis, Lex Two ($24.80) was sixth going into the final turn before Franco put her in the middle of the track where she proceeded to motor home and grab her maiden win in 1:57.2. Frontier Cuzin (Gary Rath) took third while the 6-5 favorite Yank’s Rendezvous (Casey Leonard) had to settle for fourth in first race on the card. Much the Best: The second Tillie division was raced on a sloppy racetrack with the 4-5 favorite The New Americana (Mike Oosting) a compelling two-plus length winner in 1:56.1. Violet champ Rollin Coal (Casey Leonard) made a move after the first quarter to take command and Oosting soon after pulled The New Americana out of fifth. The Steve Searle trained winner gradually gained on the leader in the last turn and then pulled away in the lane. Fox Valley Jazzy came on for second while Rollin Coal finished third. The New Americana, daughter of Yankee Skyscraper, is owned Illinoisans Chris Mroz (Norridge), Dave Falzone (Chicago) and Jim Molitor (Oak Lawn. Chalks Fall in Opens: Vintage Babe (Jim Lackey) set a blistering pace (54.4) to the half before shortening her stride in the lane as the Indiana invader Can’t Touch This (Mike Oosting) and OK Heavenly (Casey Leonard) zipped past in the $13,500 filly and mare Open Pace. Trained by Roger Welch, Can’t Touch This (9.00) won in 1:51, a mile that equaled the 4-year-old mare’s career fastest time. The third race Open came before severe storm rolled through Chicago area causing an almost hour long delay between the fourth and fifth races and turning the rain-soaked track to a sloppy surface. The 20-1 longshot A Bettors Risk ($43.80) was given a winning pocket trip by Kyle Wilfong and overtook the pace-setting Coal Hanover in the sixth race $13,500 Open Pace for male pacers. The favorite Let’s Drink On It rallied for third in the 1:51.4 mile. Friday’s night’s pair of $12,000 second round stakes series legs of the Incredible Tillie for ICF pacing fillies appears to have a completely different look from one another. The second division seems loaded compared to the first split that will go as tonight’s opener. All the current leaders in the eighth race leg will be knocking heads. They’ll vie for valuable points needed to be among the 10 highest for the $130,000 Final on Hawthorne’s September 23rd Night of Champions. There’s Hosea Williams Rolling Coal (pp 2, Casey Leonard), winner of a first leg of the Incredible Tillie and the recent Violet stake champion. Right next to her is the Steve Searle Stable’s The New Americana (pp 3, Mike Oosting), third in the first Tillie stake and second best in the Violet. The outside nine post will be manned by Shelby Rae (pp 9, Gary Rath), second best in an Incredible Tillie leg and the surprise winner a week ago in a prep for this stake, beating division leader Rollin Coal. The other first round Incredible Tillie winner Fox Valley Jazzy (Tyler Shehan) has the 10-hole tonight. Of the 10 second division starters all but two raced in the first Incredible Tillie Leg. On the other hand 8 of tonight’s 10 starters in race one weren’t ready to begin their racing careers on June 16 and missed the opening leg. So don’t be misled by what appears to be the weaker of the two freshman filly stake series events on the card. In may seem to be that way only because most of the first grouping of fillies got a later start in their careers. There are two more Incredible Tillie legs after tonight’s second round still to be contested so there’s still a long way to go to determine the finalists on Hawthorne’s Night Of Champions. The Nick Giberson Stable’s Yank’s Rendezvous (Casey Leonard) is the only first division starter with a pari-mutuel victory on her résumé, and that came a week ago. That win coupled with the one-slot will see her open as the 9-5 first flash favorite. Posts two through nine belong to Wine N Wroses (Mike Rogers), Frontier Cuzin (Gary Rath), Shelly On My Mind (Ridge Warren), Lex Two (Juan Franco), Jazzy Bern (Brian Carpenter), Red Hot Packerette (Mike Oosting), a four-time winner on the County Fair Circuit, Fox Valley Miranda (Bob Smolin) and Shooting Cool (Tim Curtin). Expect Better: Rollin Coal’s unbeaten streak was snapped at three by Shelby Rae last week. The Sagebrush filly never fired in the lane and ended up fourth beaten four lengths. The program comment on her past performance reads: “No Excuse” however that may not be entirely accurate. Can Fly Late: Anytime you see an ICF 2-year-old pacing last quarters under 27 seconds that should get your attention. It’s always gets mine. In this case the attention-getter is the state-bred filly The New Americana and you can bet she’s a threat tonight. The New Americana was stuck behind bad cover in the first Incredible Tillie leg. Once she got clear and rolling the filly sped to 26.2 last quarter when she was third to Fox Valley Jazzy. In the Violet Final The New Americana was three wide in the last turn some nine lengths behind before motoring home in 26.3 to be second best. The youngster had the seven-slot in that race. Tonight she landed the three. Also looking to literally score some points tonight for their owners are Lotus Gram (Tom Graham Jr.), Poppy Seed (Art Mc Ilmurray), JB’s Shooting Star (Tim Curtin), Watch Me Nae Mae (Kyle Husted), The Sis Master (Kyle Wilfong), and Allbeastnobeauty (Bob Smolin). Twin Treats: Friday’s program came up solid when both the $13,500 Open for fillies and mare pacers and the $13,500 Open for pacing colts and geldings each filled. Back from Hoosier Park for the third race Open mare pace is the Angela Coleman Stable’s OK Heavenly and she’s unbeaten (4-for-4) at the Hawthorne meet in the top level distaff competition. She’ll open as the 2-1 favorite. Also in from Indiana is the Roger Welch Stables Can’t Touch This, a 1:51.1 Open winner in mid-June at Hoosier Park. The now 4-year-old Indiana bred mare captured the $78,400 American National in 2015 at Balmoral as a two-year-old. Wings, Vintage Babe, Whiskersonkittens, Phyllis Jean, Fox Valley Charm and Kyles Secret will provide stern competition for those two recent Indiana Invitational mares. Let’s Drink On It (5-2, Travis Seekman), from the Joe Seekman barn, was assigned the outside eight slot in the sixth race Open Pace and warrants it after a very impressive 1:52.1 victory last week racing without cover from the backside on while pacing a 54 last half.. This week’s focal point of ICF pacers and trotters competing at Hawthorne will be fixed on the state-bred two-year-old divisions. Its round two in all four stake divisions for Illinois bred freshman as they continue their march towards what their trainers and owners hope will be a starting berth in a lucrative $130,000 (est.) final on Hawthorne’s Night of Champions in late September. To be a finalist on Hawthorne’s version of Super Night a pacer or trotter in their respective stake series outings has to perform well enough to be among the 10 highest point earners after four legs of their particular series. Those points are earned on a 50-25-12-8 and 5 basis (first through fifth finishes) with a single point given for starting and not earning a check for fifth place or higher. First up in this week’s ICF 2-year-old stake competition is Friday’s Incredible Tillie for juvenile pacing fillies. The Incredible Finale divisions for their male counterparts will head-up Saturday’s program while Sunday we’ll see both the Fox Valley Flan events for first season trotting fillies and the Kadabra competitions for freshman colt and gelding trotters. Hosea Williams’ Rollin Coal and Dale Kanitz’s Fox Valley Jazzy sit atop the Incredible Tillie point standings with 50 each after notching victories in their respective first legs. Gary Rath’s Shelby Rae has shown she could be a force in the ICF freshman filly pacing division. (Four Footed Photo). With 25 points are the second place fillies Sheincrediblenasty and Shelby Rae, who served notice last weekend she’ll very likely be a force as the freshman stake series moves along. Trainer Gary Rath steered the 24-1 longshot Shelby Rae ($51.00) to a slim nose victory in Incredible Tillie prep on Friday night with a strong stretch drive (27.3), edging out Angel Dance, and another Incredible Tillie Friday starter. Meanwhile first leg champions Fox Valley Jazzy and Rollin Coal had to settle for third and fourth, respectively, behind Shelby Rae’s 1:56.3 maiden triumph. Shelby Rae, a daughter of Duneside Perch out of the Artsplace mare Mystical Art, was the bridesmaid in her first three career starts before a fourth place finish in the Violet Final after a failed first over bid. She’s owned by Gary and his wife Kathryn of Marengo, Illinois. Second Division Loaded: The draw is out for Friday’s $12,000 Incredible Tillie events and the eighth race second split is particularly tough. All of the current leaders in the ICF freshman class landed in the eighth race split. The field (in post-position order): Lotus Gram, Rollin Coal, The New Americana, Poppy Seed, JD’s Shooting Star, Watch Me Nae Nae, The Sis Master, Allbeastnobeauty, Shelby Rae and Fox Valley Jazzy. The first Incredible Tillie division will go as the Friday opener with that field consisting of Yankee’s Rendezvous, Rine N Woses, Frontier Cuzin, Shelly On My Mind, Lex Two, Jazzy Bern, Red Hot Packerette, Fox Valley Miranda and Shooting Cool. Muddy Waters: A decisive three length victory by the Mike Brink Stable’s Muscle Image (Mike Oosting) in last Sunday’s $18,800 Cardinal trot final left the ICF 2-year-old male group without a clear-cut division leader at this point of the season. Trixie’s Jethro was a comfortable first leg winner of the Erwin S. Dygert stake series back in early June however Louscipher took the second leg in fairly easy fashion a month later. Picky Picky Valor coasted on the front-end in the recent Cardinal prep but went off stride when freshman rival Muscle Image powered past and pulled away to his first season win (1:58.1) a few nights ago in the championship. See You Later: Bernie and Deb Paul’s productive 7-year-old mare Seeyouatthefinish, a winner of 11races in both 2015 and 2016, mostly in either Opens or high level conditioned paces, is back in Pennsylvania where she competed for the first four months of this year. Seeyouatthefinish had a trio of second place finishes in three Open filly and mare events at Hawthorne in May but was idle after getting a fifth place check in the June 17 Open. The mare made over $80,000 last year and owns 36 lifetime wins in five seasons of racing. This year’s Cardinal and Violet championship contest for ICF pacers or trotters wraps up Sunday evening at Hawthorne with a pair of 3-year-old trotting stake events. In both cases, there is an early prohibitive favorite. The morning line lists the Roshun Trigg Stable’s Louscipher at 3-2 odds in the third race $17,800 Cardinal Trot Final after he drew the two-slot in the eight-horse field. The meet’s leading driver Casey Leonard will handle the Flacco Family Farms home-bred for the second time this season. 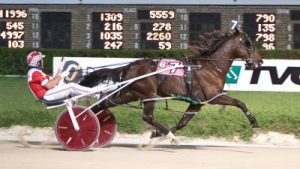 Casey drove Louscipher to his 1:56.4 career fastest mile in the second leg of the Erwin F. Dygert stake series earlier this month when the son of Lou’s Legacy was hammered down to 10 cents on the dollar. Danny Graham’s homebred filly Anna’s Lucky Star will open up at even lower odds in the fifth race $20,000 Violet showdown. Her first flash odds will be at even-money. The Nelson Willis trainee missed last week’s Violet prep when she was scratched sick. Winning races has been a habit for Anna’s Lucky Star. The daughter of Cassis has gone postward in 10 career starts and visited a winner’s circle afterwards eight times. She was second the only two starts she didn’t win and both of them came this year in open company races against colts and geldings. The Steve Searle Stable’s Daisy Lou Duke, a solid 1:59.1 winner a week ago in the Violet Prep, is the likely second betting choice despite landing the outside nine-slot. The filly does have gate speed and she won from the same outside post back in early June in the first leg of the Beulah Dygert stake series. Lous Credit Report (Mike Oosting), Queen Kong (Matt Avenatti), Beatrice (Juan Franco), Fox Valley Elana (Casey Leonard), Sis’s Ellie Mae (Dale Hiteman) and Lous Game N Match (Matt Krueger) are the other Violet hopefuls. Taking on Louscipher, last season’s ICF 2-Year-Old Male Trotter of the Year, are Muscle Image (Mike Oosting), Trixie’s Jethro (Jared Finn), Let’s Go Color (Kyle Wilfong), Picky Picky Valor (Brian Carpenter), Sharkbite Mike (Dale Hiteman), Bands Houdini (Kyle Husted). Picky Picky Valor was a front-end winner in 1:56.4 last week in the Cardinal Prep for Monee, Illinois owner Shelley Steele and beat Louscipher in that race. However, you can go to the bank that Picky Picky Valor won’t be the post time favorite. Despite his continuing improvement the Yankee Valor gelding gets my vote as the “Rodney Dangerfield” of this ICF division. In other words, the trotter gets no respect from the betting public. Picky Picky Valor has never gone off as the favorite in any of his 10 starts as a 3-year-old. In fact the average odds on the trotter this year when the starting gate springs open is 21-1. In his three starts in two ICF stakes and last Sunday’s Cardinal Prep win he’s gone off at 25-1, 53-1 and 10-1. Yet Picky Picky Valor hasn’t missed a purse check as a 3-year-old in his eight starts at Hawthorne and has a pair of seconds and a third to go along with his two season wins with his first coming in a Late Closer Series leg earlier in the meeting. Easy Does It: Casey Leonard put Fox Valley Nemitz ($5.00) on the front-end and the Nick Giberson trained gelding coasted to a three-length victory in last night’s $27,400 Cardinal Final for ICF 3-year-old pacing colts and geldings. 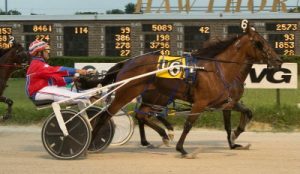 The wire-to-wire 1:51.1 victory shaved almost two full seconds of the previous mark of Fox Valley Nemitz, owned by his breeders Fox Valley Standardbreds of Sherman, Illinois. Sporty Redhot (Juan Franco), set off at 30-1, was second while Ima Skydancer (Tim Curtin) took third. Fox Valley Nemitz cut fractions of 28.1, 56, and 1:24 before pacing a 27.1 last quarter. Mammoth Pool and Payout: Hawthorne’s tenth race Jackpot High Five saw an enormous $1,413,238 wagered on it last night and yielded a whopping $64,380.68 for a winning 7-1-2-8-4 ticket. The first five finishers in the Jackpot Pick Five race were Powerful Pulse, Sweet Donna’s Girl, Naty, Backwood’s Barbie and Back Stock. There was a guaranteed pool of $500,000 and a mandatory payout on the 20 cent wager. The huge Jackpot Pick Five pool drove the Saturday night mutuel handle to $2,641,399 on the 12-race card.